Saina Nehwal, the poster girl of Indian badminton,dazzled at the Djarum Indonesia Open Super Series, retained the crown on Sunday and landed her third title in the last 19 days. Riding on her splendid form, the Indian ace downed Sayaka Sato of Japan 21-19,13-21,21-11 in the final to cap a successful three weeks which started with the Indian Open Grand Prix Gold title on the second Sunday of June. The moment she won the championship point,Saina pumped her fist in delight, closed her eyes to quietly celebrate the moment and slowly walked towards her opponent for the customary handshake. "I am very, very happy. It's a memorable moment in my life. To defend the crown is exciting and to win a third title on the trot is a great feeling.I am delighted,'' said Saina and added that she was much pleased by her consistency. "This is my 15th consecutive match and winning all of them is great. I am extremely satisfied with my performance. Winning at Chennai, Singapore and here was just amazing. I am very happy that I have been consistent over the last three weeks,'' she added. Saina got off to a brisk start in the first game securing a 9-4 lead. Sayaka fought back and led Saina at 16-17. But the Hyderabadi girl won three consecutive points to move to 19-17. Though Sayaka managed to save a game point, Saina was not to be denied for long. In the second game, Sayaka looked like a different player. She started hitting the shuttle hard and ran away to a 14-7 lead. The Japanese girl produced 14 winners, most of them smashes, and rattled the Indian before winning the second game emphatically. But Saina regrouped quickly and changed tack to unsettle her opponent. The Indian concentrated on keeping the shuttle in play without giving it much air and induced her opponent to the net. The move paid off.Sayaka started committing far too many errors. Five minutes into the third game Saina was up 7-2.She made it 15-9 and 18-10 before closing out the contest. "Realising that she's not good at the net I started playing near the net.I also did not give her the height which prevented her from going for the smashes,'' Saina said. Saina has now trained her eyes on the World Championships to be held in Paris from Aug 23 to 29. "My next target is the World title. These three victories have given me immense confidence. 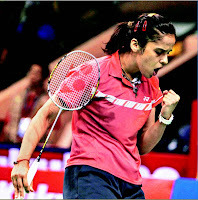 I want to train hard and do well at the World Championships,'' Saina said. Contrary to expectations, the win here will not improve her rankings as Saina only defended points she had won by clinching the title last year. Her coach Pullela Gopichand said: "It's phenomenal. Very few players are capable of winning three titles in a row. It's a result of her fitness and rigorous practice. She's very young and I am expecting more such performances from her.Once she's back we'll start preparing for the World Championships,'' Gopi said. Saina's father Harvir Singh Nehwal wept tears of joy watching his daughter win. "I always believed she can do well at international level. Before going to Singapore she told me 'papa, I'll win this title. It's God's grace that's she's doing so well. I hope she'll come up with a good performance at the World Championships as well. She's made the country proud,'' Harvir added. 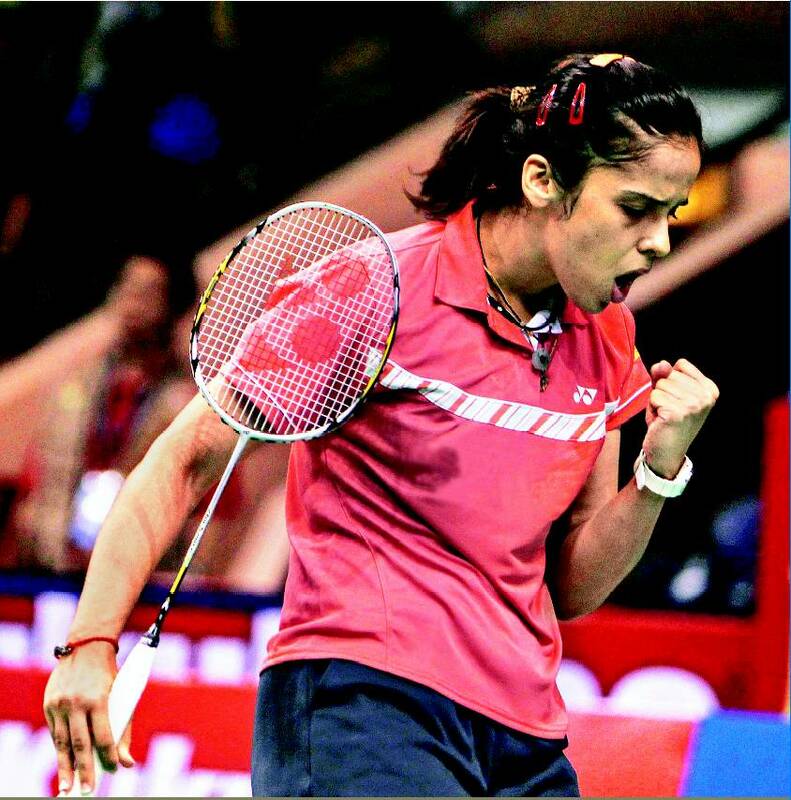 She is the first Indian to win a world junior title Indonesia Open Super Series-2009. Commonwealth Games-2006-Bronze medal in mixed team event Beijing Olympics-2008-Quarterfinals.